On Oct 2, 1881, a group of 7 men gathered in the basement of St. Mary's Church in New Haven, Connecticut, at the request of their 29-year-old pastor, Father Michael J McGivney. The end result of that meeting came just over 5 months later on March 29, 1882, with the formation of an organization that came to be known as the Knights of Columbus. Its founding purpose was to offer financial help to members and their families who were sick, disabled and financially challenged, and this remains to this day one of the principal goals of our organization. 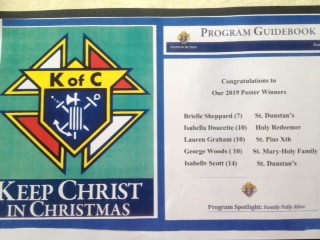 The Knights of Columbus is world's largest Catholic family fraternal service organization. There are 15,342 Councils with more than 2 million members in 17 countries around the world. They include Canada, United States, Mexico, Cuba, the Dominican Republic, the Bahamas, Guatemala, Panama, the Philippines, Poland, Lithuania, Ukraine, and South Korea Today, 135 years later, our Order remains true to its four founding principles - Charity, Unity, Fraternity and Patriotism. Knights are Catholic men, 18 and older, who are committed to making their communities better places through charitable service. Charity is the first and foremost principle of the Knights of Columbus. 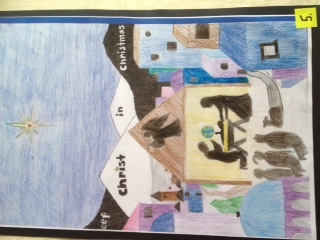 Our five key areas of service are Families including Children and Youth, Community, Church, Council and Culture of Life. Knights are called to help those in need and all Knights believe they can make a positive difference and change the world through small acts of charity and kindness at all levels, local to global. Our K of C Msgr. George A MacDonald Council #10808 The Knights of Columbus have a 99 year history on Prince Edward Island. Ours is one of 21 Councils and we are into our our 27th year. We are the Monsignor George A. MacDonald Council, named after a renowned physics professor at St. Dunstan's University in Charlottetown who was well known for his community activism and leadership. Seven founding members are still actively involved in our Council. In October, 2015, we were honoured to receive a 4 Star Award for a 475% increase in membership and our growth in community service ventures. We were one of only 5 Councils across Canada and the United States to receive such a distinction. In 2017 we won another Star Council Award for surpassing our membership quota and for new community service projects including Coats for Kids, which provided new winter jackets to 48 children and youth in need through the four schools in the Bluefield Family of Schools. We were also at the corporate tables at the fundraising gala dinner for Special Olympics the past four years and are now actively helping out in special events for young people across PEI with physical and intellectual disabilities. In the last three years we have grown from 53 to over 97 members. Currently 25% of our members are in their 30's and 40's and the vast majority of them are actively involved with our veteran members in the many projects we undertake to help out people in need, regardless of their religious affiliation. We believe that teamwork is the fuel that allows ordinary people to achieve extraordinary results. Faith Director………………..Basil Favaro Family Director……………...To be named Community Director………Wally Kowalchuk Life Director……………….Don MacDonald Our meeting times We meet the first Thursday of the month in our Parish Hall at St. Francis of Assisi Parish Church in Cornwall. On average 25-30 members take part in our meetings and visiting Knights are always welcomed. All meetings are followed by a social hour with treats donated by volunteer members. We often begin our social hour with invited guest presentations on key themes relative to our service work. Monthly meetings are usually preceded by an Executive Meeting on the previous Tuesday evening. We continue to be active and proactive throughout the summer through fund raising initiatives such as barbecues in our local shopping plaza for Coats for Kids and our Fall Bursary Program. Our Annual Council Report – updated January 26, 2019 – is attached is a separate document. Our Council represents and serves 3 parishes in the Good Shepherd Pastoral Unit– St. Francis of Assisi, Cornwall; St. Anne’s, Emyvale; and St. Martin of Tours, Cumberland. Our current membership stands at 97 and our goal is to reach 100 by our annual Charter Night dinner in May, with the help of our dedicated Admission Degree team. When the new Faith-in-Action model was announced last September, our Council responded enthusiastically with the appointment of Claude Parent as Faith-in-Action Program Director. By January we had 3 new directors appointed – Faith Director Basil Favaro, Community Director Wally Kowalchuk and Life Director Don MacDonald. Our Family Director will soon be named. The following is a summary of our activities in each of the four Faith-in-Action pathways. Parish Leadership. Active Council members served in key Church leadership roles again this year, including Kerry Moore, first President of our St. Vincent de Paul Society, and Leonard Rogers, who heads St. Francis of Assisi Parish Property and Finance Committee. In total, we contributed over 1400 volunteer hours to Church life in the Good Shepherd Pastoral Unit this year through parish leadership and Church ministries. 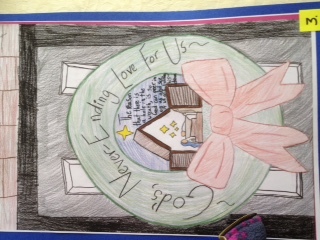 This does not include the hundreds of hours of dedicated service and generous commitment put in by our new Chaplain Fr. Doug MacDonald, who actively contributes to every aspect of Council life. Seminaries We donated $500 to the Foreign Mission Fund in support of training for new seminarians in India. Sacramental Gifts A significant Council initiative, launched last year, with the creation and distribution of our welcome Baptism Kit, expanded to include 22 young families this year. Church facilities. 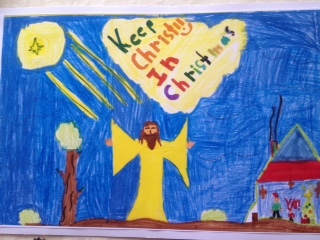 Our Keep Christ in Christmas highway sign continued to draw wide attention and praise in our community this past Christmas season. Our Council coordinated a grounds clean up at St. Francis of Assisi in May and provided a barbecue for 30 volunteers. We also donated a freezer to the Food Pantry taken over this year by our St. Vincent de Paul Society. The pantry is open three times a week for local families in need from all faiths. Prayer and Study Program On Monday March 25th our regular noon Mass will commemorate the International Knights of Columbus Day of Prayer for the Unborn Child. The visiting icon of Our Lady Help for Persecuted Christians will be officially announced at St. Francis of Assisi Parish at Mass on Sunday May 4th. At our Sunday morning Mass on June 2nd, we will extend a special welcome to persons with physical and developmental disabilities. A planned Lenten Novena- for-Life is described below under Life Activities. Seven of our Council members took part in the Into the Breach Saturday Program for Catholic men hosted by Council #824 last Fall. Food for Families Five Knights took part again this year in the preparation and distribution of Christmas Food Boxes to 55 families. We also prepared and served 220 dinners at the Upper Room Hospitality Centre in Charlottetown. We made significant donations of new clothing, toiletries, children’s books and toys to our annual Christmas Free Store. Our most recent initiative is Don’t Give Up Chocolate for Lent, with the launch of non-perishable food hampers in our three parishes during Lent for the community Food Pantry. 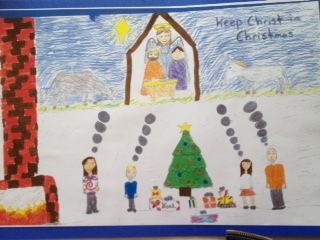 Keep Christ in Christmas We had an enthusiastic response again this year to our annual children’s poster challenge and awarded $250 in prizes to winners from two parishes in all three age categories. 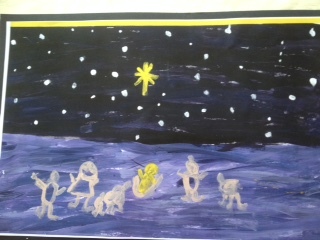 Also as new part of the Keep Christ in Christmas theme this year was our Council’s first outdoor nativity scene competition held in December. Special Family Programs Our annual family sleigh ride in February at Potts Farm in Bonshaw was expanded this year to include all parishioners and was well attended. We plan to host again our annual summer family picnic, this time in June to ensure wider participation. Coats for Kids. One of our most successful repeat projects was our donation of 15 new winter jackets and pants with complete accessories head to toe to children in need in our local primary and elementary schools. Thanks to our partnership with the St. Francis of Assisi CWL, our success in summer barbecue fundraisers, and the leadership of guidance counsellors in Westwood and Eliot River Schools, our Coats for Kids Project once again helped out many families in need and also brought accolades to our Council from many community agencies. Hospitals / Health Organizations. Through a summer barbecue fundraiser, we donated $300 to Lennon Recovery House, North Rustico, in support of persons with addictions and mental health challenges. Concerts for Community Building Our Knights Chorus performed again for 50 residents at Andrew’s Senior Care Home in Charlottetown an evening singalong including Celtic, folk, and pop music. Based on an enthusiastic response, a new St Francis Chorus of Knights and Ladies will perform there this Spring. Our Council organized and hosted a first choral workshop weekend in September with renowned vocal conductor Paul Grambo from Ontario and acclaimed accompanist Leo Marchildon from Charlottetown. In total, 55 singers representing 9 Church and community choirs took part in two workshops and offered a Saturday evening concert with visiting choir Coro Cantabile from Cape Breton. Community building events such as these continued to strengthen our identity as Knights well beyond our three parishes. Mikinduri Project for Children in Kenya Our Mikinduri Children of Hope Foundation project continued this year with 8 deliveries (1600 kg of clothing and other items from our donation bin) to provide nutritious meals to thousands of school children in Eastern Province, Kenya. Basketball Free-Throw Our Council sponsored our annual competition organized by two members, in collaboration with the Eliot River Elementary School Physical Education staff. Youth Groups/ Welfare / Service We awarded four $250 bursaries in September to high school graduates pursuing further studies. In addition one of our anchor Knights, Reg McCarvill, estimated that he raised over $10,000 in fundraising for Big Brothers /Big Sisters over the past 10-15 years. In May we will hire five youth once again to serve at our annual Charter Night dinner and in June we will make our annual donation to enable youth from our pastoral unit to attend the Steubenville Leadership Conference in Nova Scotia this coming summer. Successful Fundraisers for Charities Long-standing partnerships with two local businesses –Don Leary’s Independent Grocery and Wally’s Pharmasave – continued to be significant factors in our successful community barbecue fundraising ventures again this year. Three full breakfast/brunches offered after Sunday Masses brought in record parishioner good will offerings. A recent wine tasting social evening was greatly enjoyed by all 45 guests in attendance. .These Council-organized social events all played key roles in building community spirit. Another long-standing tradition, now in its 22nd year, is our Christmas tree sales drive. In partnership with the Independent Grocery, this year’s fundraiser was one of the most successful on record. In total, 22 members participated in setting up, selling and delivering the trees and dismantling the cage. Directed by Ed Harper and Keith Fraser, this project raised over $2200 through a huge Council team effort of over 400 volunteer hours. Several families in need received free Christmas trees through this project. Honouring Veterans Our esteemed Council members who have served our country as veterans, including Arthur Mahar, Ray Gaudet and David Murphy, play active leadership roles in our Council. We honour them and all veterans each year with wreath laying ceremonies at two Memorial Services, one in September in Cornwall, now in its 99th year, and the second at the annual Remembrance Day service. Novena-for-Life A Novena-for-Life introduced by our Council will begin on March 24th in our three churches and conclude on April 1. Donations. Annual donations of $150 have been recently approved for Right to Life and Birthright Associations. Two Executive members continued to serve as Directors on Birthright and on key standing committees. Memorial Garden Our Council Recorder Dana Dennis and his family continued to maintain our Garden Memorial to Unborn Children at the entrance of the St. Francis of Assisi Church. Special Olympics Our Deputy Grand Knight Trevor MacKinnon contributed significantly (45 hours) this past year as a board member for Special Olympics. This included participation in truck convoy and polar plunge projects, meet and greet and sporting events for athletes, and send-offs for athletes travelling off-Island for their competitions. Another dedicated Council member, Michael MacKenzie, worked up to 14 hours weekly transferring people with disabilities from beds to wheelchairs and helping others with canes and walkers. Four Council members volunteered 12 hours to help with the Special Olympics Annual Bowling tournament in May and one represented our team at the final awards ceremony. Our Council also sponsored a Knight and his wife to the K of C corporate table at the annual Special Olympics Fundraising Gala Dinner at the Delta Charlottetown in June. Christian Refugee Relief St. Francis of Assisi Parish has formed a Refugee Committee with several sub-committees to plan for the arrival of a young refugee family of four from Pakistan via Thailand next year. Seven Council members including the Committee Chair, Gerald Gabriel, are actively involved in this significant humanitarian initiative. We find the new Faith-in-Action model very helpful in keeping us clearly focused on practical Church and community projects in the four key pathways to becoming true Knights of Charity. They are already serving to bring sharper focus and purpose to our meetings, which are an hour on the first Thursday of the month. Our meetings are always followed by a social hour with refreshments. We average 22 at our meetings and 30+ when the social hour involves guest speakers, such as our Chaplain Fr. Doug speaking last Fall about his journey to and in the priesthood, and our Brother Knight Brian Francis recently sharing his Mi’kmaq life journey and what it is like to be a Canadian Senator. As this report was being written, we have confirmation of four new members including a transfer just approved, two new members on-line who have requested admission to our Council, and a new recruit from the Prince Edward Home for Restorative Care. All signs are pointing to our surpassing our target of 100 by May. Our Council is justly proud of its recruitment success from 53 members just four years ago. In closing, we continue to reap the benefits of many of our younger Knights attending meetings regularly, playing active roles in our fund-raising and community service ventures, and showing real leadership in many Council activities, including recruitment. This we feel is one of the best indicators of healthy, sustainable growth as a Council.